The doors of the red cabin clicked shut, the cable car jerked and began its rapid ascent. Unsupported by pylons, the rising cable car seemed about to slap into the bare face of the sheer cliff, eliciting squeals and nervous laughter from the crowded passengers. It took less than three minutes to climb over seven hundred metres from the Falzarego Pass to the Lagazoui station. At the top, relieved passengers spilled out onto a metal platform and jockeyed for position on the surrounding terrace, fighting to admire one of the most jaw-dropping sights in the European Alps: a 360-degree view that stretches across the Italian Dolomites to the Austrian border and beyond. It takes in over one hundred and forty peaks, including some of the most famous: to the Adamello, Le Tofane, glacial-capped Marmolada and the Cinque Torri, five crags that cast long shadows over the nearby town of Cortina d’Ampezzo. The wonderful Rifugio Lagazuoi is only a short climb up some metal stairs from the cable car station. At 2752 metres above sea level, the Rifugio is one of the highest mountain lodges in the Dolomites. It was built by the Pompanin family in 1963 when there was nothing here but mountain goats and the crumbled remains of some World War I fortifications. Two generations later, it is still in the family’s hands. With cliffs on two sides and a long deep valley on the other, the Rifugio is only accessible by the cable car or on foot/skis. There isn’t another building in sight, no ski-lifts, no hotels, just the magnificent snow-covered valleys and peaks of the most beautiful mountains in the world, stretching to the horizon in all directions. The Rifugio can sleep seventy-four people in seven private rooms and five dormitories. It has a sauna, a large fireplace, a spectacular terrace and serves hearty mountain food. Spending a couple of days up here in winter is an extraordinary experience but take your woollies though, the minimum temperature tonight is -16 degrees. By car: To get to the Falzarego Pass (from where you take the cable car to the Rifugio Lagazuoi) from Venice, take the Mestre – Belluno autostrada (A 27) and then the the Pian di Vedoia exit, following the signs for Cortina d’Ampezzo (it is 75 kilometres from the exit to the pass). There is a carpark at the cable car station. By plane: the closest airports are Treviso and Venice. In winter, there are regular shuttles from both airports to Cortina (www.cortinaexpress.it/en/). Rifugio Lagazoui (Monte Lagazuoi, Cortina d’Ampezzo; www.rifugiolagazuoi.com; mobile: +39 340 7195306). A unique experience in a very comfortable, family-run ‘rifugio’. The cost per night for a private room with four people is 46 euro b&b or 68 euro person half-board (the recommended option). There is also dormitory accommodation available. Hotel Al Sasso di Stria (Piani Di Falzarego, 12, 32020 Livinallongo; +39 04367135; http://alsassodistria.com). For an alternative, you could try this very comfortable 2-star family run hotel in an isolated position a shport drive from the Falzarego Pass. Hotel Piccolo Pocol (Locality Cortina, Pocol 48, www.hotelpocol.com). This very comfortable 3-star hotel is in a small hamlet between the Falzarego Pass and Cortina. Doubles from 180 euro b&b. Hotel Mirage (Via Pezie' 118, Cortina d’Ampezzo, +39 0436 868510; www.miragecortina.it). For a bit of a treat, try this very comfortable 4-star, which is perched on a hill a short walk south of Cortina d’Ampezzo. Check in and enjoy an aperitivo sitting on the terrace watching the extraordinary spectacle of the sun setting over the snow-covered peaks of the ‘most beautiful mountains in the world’. Then slip inside for a hearty dinner of mountain coking before hitting the rack early for an early start tomorrow. The longest run leaves from below the rifugio, sweeping back down to the Falzarego Pass, looping underneath the mountain. It has 650 metres of descent, with fantastic views over the Cinque Torri, the snow-covered cliffs of the Falzarego and the looming rocks of Sasso il Stria. The expression “Tomorrow we are doing the Armentarola” is a battle-cry that you will hear each evening in the rifugio. Armentarola is a hamlet near the town of San Cassiano in the neighbouring Alta Badia valley. The run to Armentarola is over seven kilometres long, with a total descent of 1,100 metres. Despite its statistics, it is a gentle and relaxing run. What makes it special is the environment it passes through: not a building or chairlift in sight, the ‘Armentarola’ is bounded by the dramatic cliffs of the Fanes and Conturines National Park, which, with their towering precipices and frozen waterfalls, give a real sense of wilderness. The first sign of civilisation is the historic Scotoni Rifugio (1985 mts) a popular stop, famous for its grilled meats. The run then continues through a narrow canyon that brings you out at the last stretch, a flat plain where you will have to you to use your ski poles or hook up to a horse-drawn carriage with ropes out the back will pull you along all the way to Armentarola. From here you can get a shuttle back to the cable car at Falzarego Pass. For a real indulgence though, you could continue on to San Cassiano, another 1.5 kms down the valley from Armentarola and have lunch at Ristorante St Hubertus at the Hotel Rosa Alpina, one ten Italian restaurants to currently have three Michelin stars. The ‘Grandi Classici’ menu, which features local lamb, is 200 euro per head (wine degustation of six Tyrolean wines is an additional 110 euro, or 150 euro, if you are thirsty and would like to try eight wines). Monte Lagazoui was the site of some of the bloodiest fighting in World War I. 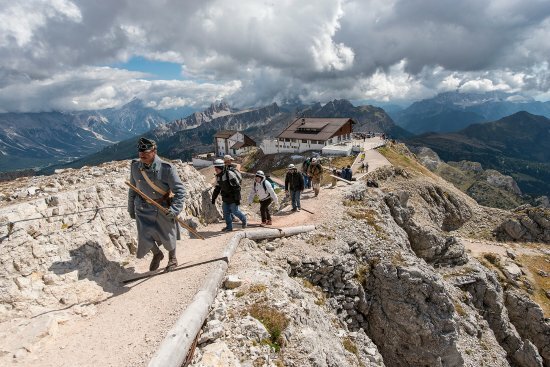 Between 1915 and 1917, the Austrian army sat at the top of the mountain (where the rifugio is) with the Italian army at the bottom (where the carpark is) relentlessly trying to scale the cliffs and unseat their enemy. Italian engineers slowly progressed up the cliffs, tunnelling into the limestone rock to build machine impostations and excavate an amazing network of tunnels and chambers that housed men, weapons and provisions. In the end, they also tunnelled directly under the Austrians to place enormous amounts of explosives and their enemies’ bases. The Austrians responded by tunnelling as well, trying to check the Italian advances. A ridiculous war where more men died from the appalling conditions than through direct combat. Many vestiges of the war remain, lookouts and trails carved into the rock below the rifugio, but the most impressive is the elliptical tunnel that the Italians carved inside the rock. A narrow, dark twisting stairway that winds from the top of the cliffs down to the pass that has been restored and is open to the public. The start of the tunnel is just below the top cable station and the exit is down at the car park at the bottom. The trail is marked and takes around one hour to complete. You’ll need a good pair of boots and a torch (there are only occasional viewpoints letting in light). Cortina d’Ampezzo is said to the ‘Queen of the Dolomites’, a beautiful, and prosperous town, twenty kilometres drive from the Falzarego Pass. A little faded from its glory days in the 1960s, Cortina still has lots of charm and shops, as well as some very interesting exhibitions including ‘Andy Warhol, Superstar’ (until 22 April) and ‘Snowland’, a fabulous exhibition of the latest photos by Stefano Zardini (also until 22 April). Details for both at www.dolomiti.org/it/cortina/servizi-informazioni-vacanze/mostre-musei/ . Cortina also annually hosts a leg of the Womens’ World Cup, this year between 19 and 21 January, www.cortinaclassic.com.